DP Although I have seen many pieces by Giacometti and admire many of them – perhaps because they incorporate for me something you might call the ‘elegance of simplicity’ – I had never seen this sculpture. It was recently on exhibit in New York, and I came around the corner – and found it immediately breathtaking. So I chose this because this is the most recent piece that I have seen that is just plain stunning, in a direct, sensory, unmediated way. And it stays amazing after looking at it for a long time: sustained beauty. The overall size (it is about as tall as I am) forces you to see the female figure eye-to-eye. The global, configural aspect (for example the large wheels – which cannot move) tell a very different story than the local, featural details (for example the nuanced painted face of the female figure). Every angle offers something unexpected, engaging, interesting, balanced, unbalanced, stimulating. This sculpture is crazy good! I kept looking at it, off and on, for an entire evening and found more to like, admire, and enjoy with every glance. GB Does the existentialist philosophy associated with Giacometti’s sculptures affect your view of its beauty? Does it really convey alienation or despair to you? Can it provide us with any consolation for this bleak view of the human condition? DP I have liked Giacometti’s sculptures since I was first dragged to museums by my parents, but I did not (and still do not) know much about his philosophy. I have always found his sculptures to be marvels of geometric intuition, but also examples of tension, and also examples of subtle humour. Maybe I have the advantage of the absence of knowledge, in this regard … I am unshackled from knowledge about his putative philosophical principles. Perhaps that reveals my naiveté as a viewer. But, in general (in my line of work, neuroscience, as well, by the way), philosophical principle does not always translate transparently into ‘form,’ be it artistic or scientific. Language is different in this regard. I can tell you my manifesto – but painting or composing it for you is not really possible. Visual rhetoric or musical expressiveness are amazing ways to stimulate thought, emotion, memory, and so on, but ideas proper are best conveyed with language, if that is one’s aim. 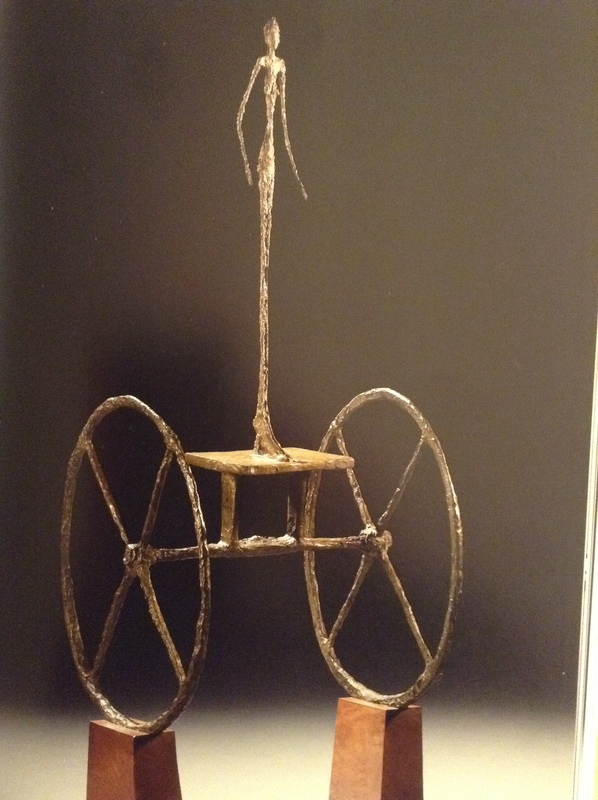 GB Giacometti went to great lengths to avoid specific characteristics, making his figures strangers. Do you even see this figure as female? Are there any characteristics that you think you have attributed to her through your own imagination, in spite of its creators wish to avoid associations? GB Giacometti claimed to make these sculptures without thinking. But he has such great style. When you look at this work do you think about the craftsmanship involved? DP Maybe the original plan for this was based purely on intuition. There exists a hurried-looking sketch of the sculpture that outlined the idea, and I’m certainly willing to accept that Giacometti himself believed that he worked without much conscious deliberation. But … introspection is a lousy guide when it comes to the analysis of complicated procedures, such as working on a multifaceted sculpture. In my view, the thought and craftsmanship that went into this piece become evident both in one’s immediate sensory, gut-level reaction as well as in the context of the more sustained, deliberative, slower appreciation of the sculpture. I find the tensions remarkable, starting with the base. On the one hand, you have these two big chariot wheels, about as compelling a visualisation of movement as you can get; on the other hand, the wheels are propped up on these two static holders, removing even the possibility of motion. Similarly, the elegant female figure looks both gracefully still and ready to walk, or perhaps to balance on the moving chariot. When you walk around the sculpture, each angle reveals new and unanticipated features and tensions, both at the scale of the entire piece and on the scale of small details, including the subtle paint. Maybe an artist can work on this without thinking too hard – but the thoughtful craftsmanship is visible from every vantage point. GB Can you describe this – or any – aesthetic experience in terms of neuroscience? GB Do you think this is universally beautiful? DP Yes, I do. I realise that such a view is not popular, but the structural and functional organisation of the mind/brain provides framework conditions for all of perception and cognition – and aesthetic experience and judgment are no exception. There exists remarkable individual variability in terms of preferences, to be sure, and all the usual effects of experience, culture, and frequency of exposure to a given piece of art obtain. That being said, I am willing to bet that there are universals in aesthetics, even if there are very few such principles. Whatever these underlying principles are, though, we can come to understand (part of) them with new ideas, clever experimentation, and fearless young students who pursue such approaches unbiased by prior feelings, opinions – and even results. The study of the neural basis of aesthetic experience merits new theories, and even the most unpopular views deserve to be reexamined. GB Does the fact that this sculpture just sold for US$90 million indicate that it has an objective beauty? Do you think value influences our view of its beauty? DP Yes, value influences our judgment of beauty. Of course. These framing effects show up everywhere. The question is whether such information is the main or only aspect underpinning the judgment of beauty – and I think not. The judgments one makes have multiple parts – for example fast, gut level, sensory judgments and slow, deliberative, normative judgments. These different aspects of an evaluation can be incongruent (“This hideous piece of junk cost $10,000?” or “This exquisite masterpiece was given away for $100?”) or congruent (“Good God, yes, I would have paid $10,000 for this magnificent performance.”) But the information about social and market value can only influence part of one’s judgment, but I am naively optimistic that there exists a ‘residue’ of a pure judgment of beauty separate from socially normative assessments. DP The ability to move me, to make me laugh, to show me something in unexpected ways, to evince an immediate emotion. I am most often moved by music, but some pieces, such as the one I selected, are just plain beautiful. Don’t you agree?